Victoria’s first Volvo Euro 6 route-service bus was delivered to Latrobe Valley Bus Lines at a launch event at Morwell in July. Volvo staff, Volgren Bus Victoria, Public Transport Victoria, CMV Group, local politicians and LaTrobe Valley Bus Lines staff gathered to mark the occasion. 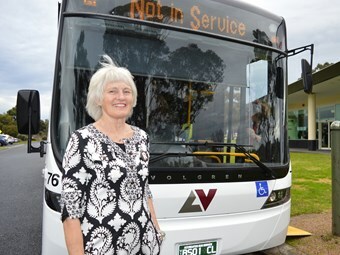 Latrobe Valley Bus Lines managing director Rhonda Renwick says she is proud to introduce the newest member of its fleet the Volvo Euro 6 saying the low emissions bus fits in well with the organisations commitment to the environment. "Our environmental initiatives include a commitment to a modern fleet of buses in good mechanical order," she says. "We have also invested in environmentally friendly above-ground, fully-bunted storage tanks at each depot and decommissioning of the old underground storage tanks. "We work hard to be leaders in healthy workplaces, diverse and equal employment and introducing environmentally friendly vehicles. "These new wheels will be going up and down, round and round the Latrobe Valley all day long." The Euro 6 , with a Volgren Optimus body, reduces particular matter emissions by up to 80 per cent and nitrous oxide by up to 60 per cent and uses less fuel overall and is has a very quiet engine. Volvo Australia general manager Sean Copeland says Latrobe Valley Bus Lines like to do things a little differently and he is confident the operation will benefit from the latest low-emissions technology that underpins the Euro 6. "Latrobe Valley really bring those values to the forefront. "I pitched the idea of taking the first Euro 6 city bus in Australia to Latrobe Valley, because rural and regional areas of Australia don’t get a lot of airplay. "They don’t get a lot of new technology, their always the last ones. "So I could not have been prouder when they said yes." Special guest speaker and Federal member for Eastern Victoria Harriet Shing says it’s great to see Latrobe Valley businesses partnering with the manufacturing industry to introduce world-leading technology in ways that benefit people in the community. "We have a very large reliance on public transport in the Latrobe Valley," she says. "These areas don’t get the resources or funding they need and deserve to overcome the tyranny of distance, so it’s great we are now the recipients of such cutting-edge technology." "Latrobe Valley Bus Lines has made a significant difference to the community over the years by introducing more frequent and reliable services." Volvo Australia has asked that Latrobe Valley Bus Lines supply the organisation with fuel consumption data, so this can be used as a real-world example of the benefits of Volvo’s Euro 6.